The “Beast” is gone! 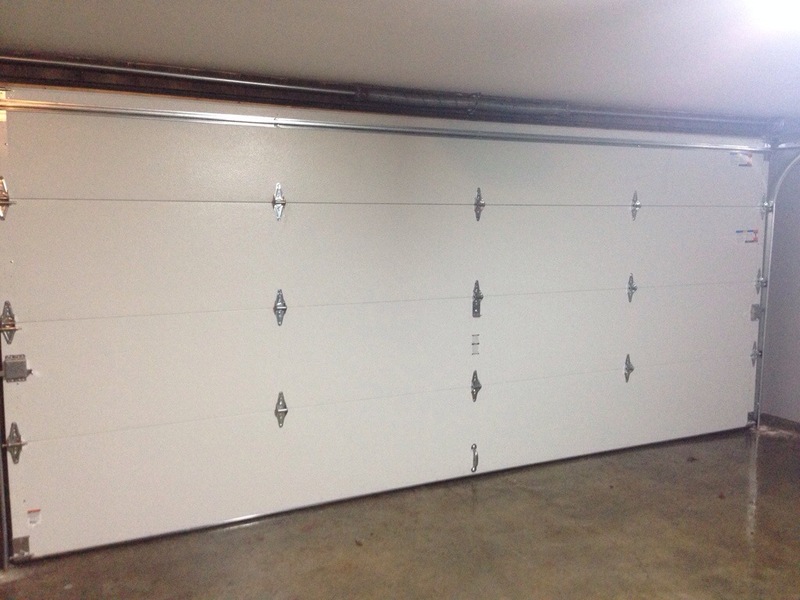 Hello new garage door! I’ve been woefully neglecting to post “before and afters” and “house tour” photos…(For good reason.) We don’t really have any photos to be proud of. Between replacing water heaters, a new roof, new fences, asbestos abatement, etc these are all high cost projects but none are really Pinterest- worthy. Yeah cause I’m sure you all want to see close ups of a water heater right? (Ooh a Rheem 2000, I’m going to pin that!) We’ve been responsible homeowners and savers. We’ve paid cash, (instead of taking the easy route of plastic) and sticking to a strict renovation budget. Putting aside our “wants”, we’ve focused on the “needs”. B-O-R-I-N-G! But today we finally get to cross a project that was a “want” and sort-of a “need”. 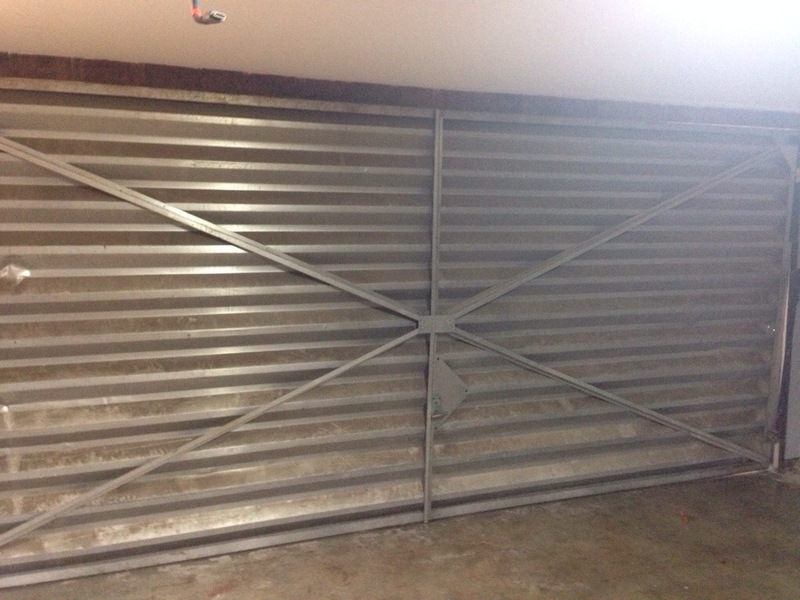 Our 1948 solid metal garage door is gone! Or rather what we called the Beast! All metal, no insulation, original springs about to snap, it seriously needed to go! 200-300 lbs of scariness! Our garage guy even had to saw through the rusted metal springs. (It was nail biter today) . 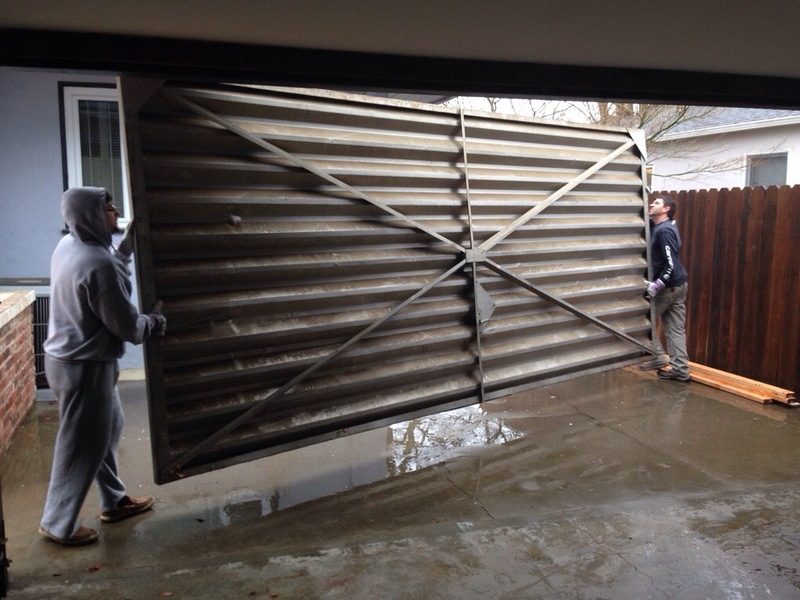 Here is the hubby and installer straining under the weight of it…(looks like some rainy day fun). These guys were troopers! 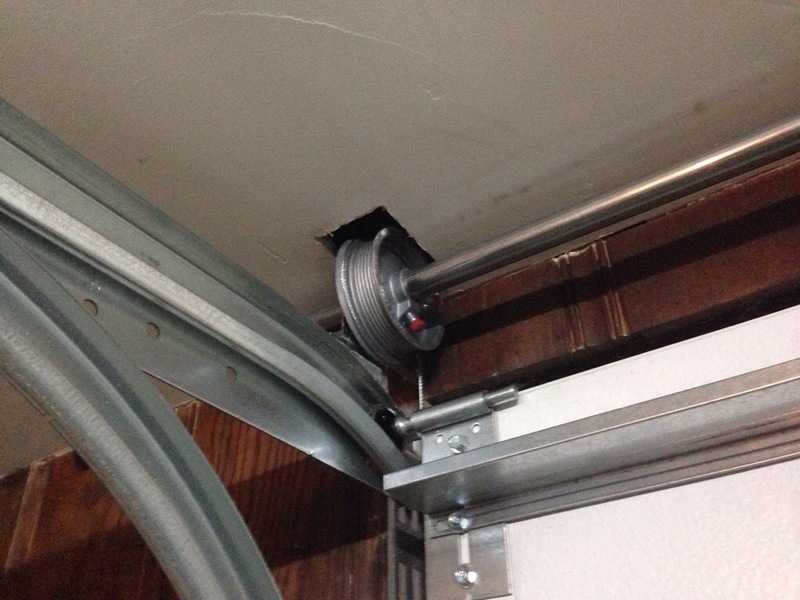 One of the trickier aspects of the new garage door was to install the modern day springs/pully system. 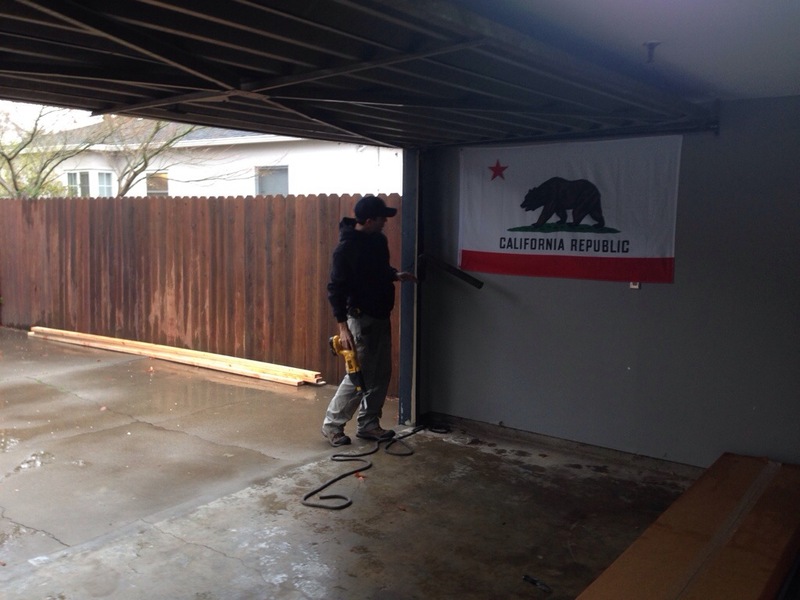 They had to cut into the ceiling to account for our low garage overhead. Yet I will trade holes in the ceiling for this beauty any day! Yay to our first true “before & after” shot! 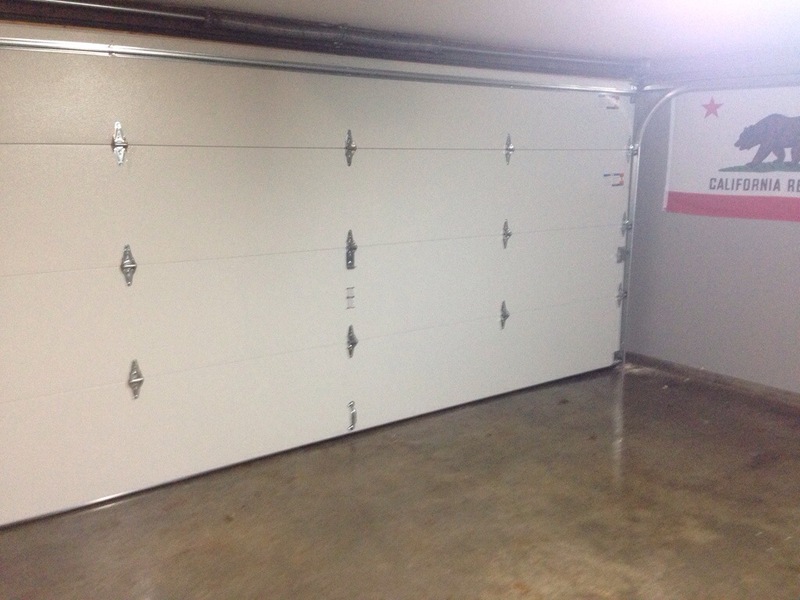 This entry was posted in Projects and tagged mancave update, metal garage door, new garage door by Tandra. Bookmark the permalink.